If you wear any color in 2018 have it be pink. Whether it be makeup, jewelry, nail polish or clothing it’s time to break out all things pink. And I’m not talking the millennial pink of 2017, I’m talking bold, bright, HOT pink! And the best part about this trend…I’d say 95% of you already own something pink so it’s easy to jump onboard. Designers like Tom Ford, ACNE and Oscar de la Renta sent statement hot pink looks down the Spring 2018 runway and the Fall 2018 runways were FILLED with monochromatic hot pink looks from Alexander Wang, Tory Burch, Christian Siriano and much more! Many designers also added flashes of pink to their model’s beauty looks. Jeremy Scott’s neon pink and glitter dipped nails added a fun touch to his already crazy designs while Richmond went for a pretty punk look with graphic neon pink eyes. Hot pink isn’t just here for the Spring and Summer, but it’s taking us all the way to the end of 2018 and beyond I’m sure. So like the title of this post says, hot pink, is THE color you should be wearing in 2018. 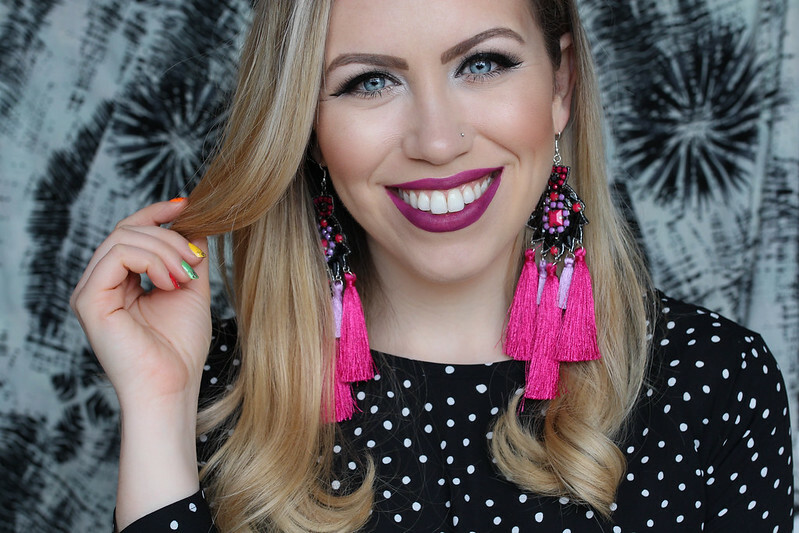 But today I wanted to talk about 2 easy ways to add hot pink to your look this Spring…lipstick and jewelry! You all know I’m no stranger to hot pink lipstick, but today I wanted to show you how wearable it actually is. This magenta pink matte shade is so flattering and not as stark and shocking as a true neon, but it’s equally as HOT. 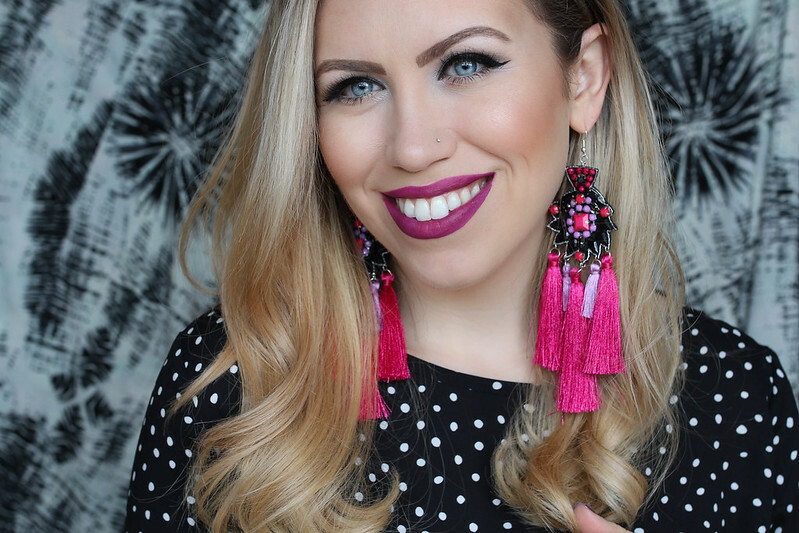 As for these statement earrings, they’re definitely statement making, but you keep the rest of your look a little more demure, you can afford to get a little crazy with your accessories. So what do you think? Do you agree with me and think that pink the color you should be wearing in 2018? Prime face with Maybelline FaceStudio Master Prime Blue + Illuminate (c/o). Prime under eye with Maybelline FaceStudio Master Camo Color Correcting Pen (c/o). Apply Hourglass Vanish Seamless Finish Foundation Stick with e.l.f.’s Foundation Blurring Brush. Conceal under eye circles with bareMinerals BAREPRO 16-HR Full Coverage Concealer (c/o). Prep lids with Ulta Matte Eye Primer (c/o). Apply shade 9 from e.l.f. Cosmetic’s Everyday Smoky Palette from lashes to crease and along lower lashes and blend, apply shade 1 from the same palette to inner corners of eyes. Line upper lashes with Maybelline Eye Studio Master Precise Liquid Eyeliner. Groom brows with Kevyn Aucoin The Precision Brow Pencil (c/o). Set brows in place with e.l.f. Sweat Resistant Brow Gel (c/o). Apply Urban Decay Vice Liquid Lipstick in Crank (c/o) to lips.